FDA Approves Lexicon Drug XERMELO! 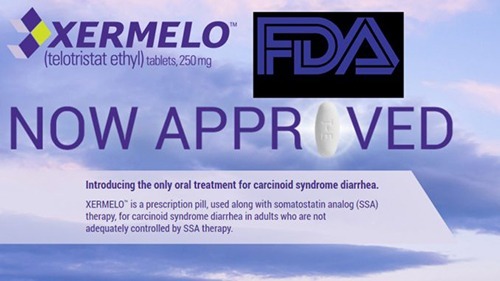 FDA Approves Lexicon Drug Xermelo (TELOTRISTAT ETHYL) 250 MG as first and only oral treatment for Carcinoid Syndrome Diarrhea in cancer patients with Metastatic Neuroendocrine Tumors! The Woodlands, Texas, February 28, 2017 – Lexicon Pharmaceuticals, Inc. (Nasdaq: LXRX) announced today that the U.S. Food and Drug Administration (FDA) has approved XERMELO (telotristat ethyl) 250 mg as a first and only orally administered therapy for the treatment of carcinoid syndrome diarrhea in combination with somatostatin analog (SSA) therapy in adults inadequately controlled by SSA therapyi. Carcinoid syndrome is a rare and debilitating condition that affects people with metastatic neuroendocrine tumors (mNETs)ii. XERMELO targets the overproduction of serotonin inside mNET cellsiii, providing a new treatment option for patients suffering from carcinoid syndrome diarrhea. This new treatment is now available by prescription and will be in select specialty pharmacies beginning March 6, 2017. Carcinoid syndrome is a rare condition that occurs in patients living with mNETsiv and is characterized by frequent and debilitating diarrhea that often prevents patients from leading active, predictable lives, as well as by facial flushing, abdominal pain, fatigue and, over time, heart valve damage. Discovered using Lexicon’s unique approach to gene science, XERMELO is the first and only approved oral therapy for carcinoid syndrome diarrhea. XERMELO targets tryptophan hydroxylase, an enzyme that mediates the excess serotonin production within mNET cells. Lexicon has built the in-house capability and infrastructure to launch and market XERMELO in the U.S., where it retains all commercialization rights. Lexicon also retains rights to market telotristat ethyl in Japan. Lexicon has established a license and collaboration agreement with Ipsen to commercialize telotristat ethyl in Europe and other countries outside of U.S. and Japan. For more information about XERMELO, please visit www.xermelo.com. Warnings and Precautions: XERMELO may cause constipation which can be serious. Monitor for signs and symptoms of constipation and/or severe, persistent, or worsening abdominal pain in patients taking XERMELO. Discontinue XERMELO if severe constipation or severe persistent or worsening abdominal pain develops. Adverse Reactions: The most common adverse reactions (≥5%) include nausea, headache, increased GGT, depression, peripheral edema, flatulence, decreased appetite, and pyrexia. Drug Interactions: If necessary, consider increasing the dose of concomitant CYP3A4 substrates, as XERMELO may decrease their systemic exposure. For more information about XERMELO, see Full Prescribing Information at www.xermelo.com. Lexicon is a fully integrated biopharmaceutical company that is applying a unique approach to gene science based on Nobel Prize-winning technology to discover and develop precise medicines for patients with serious, chronic conditions. Through its Genome5000 program, Lexicon scientists have studied the role and function of nearly 5,000 genes over the last 20 years and have identified more than 100 protein targets with significant therapeutic potential in a range of diseases. Through the precise targeting of these proteins, Lexicon is pioneering the discovery and development of innovative medicines to safely and effectively treat disease. In addition to XERMELO, Lexicon has a pipeline of promising drug candidates in clinical and preclinical development in diabetes and metabolism and neuropathic pain. For additional information please visit www.lexpharma.com. In an effort to ensure all appropriate patients have fast access to affordable treatment, Lexicon offers LexCares—a comprehensive program designed to guide patients through each step of their treatment journey. Through LexCares, patients will have access to financial assistance programs that may reduce or eliminate out-of-pocket costs associated with their XERMELO prescription. For additional information about the LexCares program, visit www.xermelo.com/lexcares. This press release contains “forward‑looking statements,” including statements relating to the safety and efficacy and the therapeutic and commercial potential of XERMELO (telotristat ethyl) 250 mg. In addition, this press release also contains forward looking statements relating to Lexicon’s growth and future operating results, discovery and development of products, strategic alliances and intellectual property, as well as other matters that are not historical facts or information. All forward‑looking statements are based on management’s current assumptions and expectations and involve risks, uncertainties and other important factors, specifically including the degree of market acceptance of XERMELO, the availability of coverage and reimbursement for XERMELO, Lexicon’s dependence on third parties for manufacturing and distribution of XERMELO, Lexicon’s compliance with applicable legal and regulatory requirements and other factors relating to the commercialization of XERMELO. Other risks include Lexicon’s ability to meet its capital requirements, successfully conduct preclinical and clinical development and obtain necessary regulatory approvals of its other potential drug candidates, achieve its operational objectives, obtain patent protection for its discoveries and establish strategic alliances, as well as additional factors relating to manufacturing, intellectual property rights, and the therapeutic or commercial value of its drug candidates. Any of these risks, uncertainties and other factors may cause Lexicon’s actual results to be materially different from any future results expressed or implied by such forward‑looking statements. Information identifying such important factors is contained under “Risk Factors” in Lexicon’s annual report on Form 10‑K for the year ended December 31, 2015, as filed with the Securities and Exchange Commission. Lexicon undertakes no obligation to update or revise any such forward‑looking statements, whether as a result of new information, future events or otherwise. Your ticket for the: FDA Approves Lexicon Drug XERMELO!